IFWG Publishing International, 9780992365493, 254pp. The Garza family's Christmas vacation in Mexico is cut short by the appearance of Pingo, one of the tzapame - Little People. The news is grim - a rogue prince from an ancient undersea kingdom is seeking the Shadow Stone, a device he will use to flood the world and wipe out humanity. 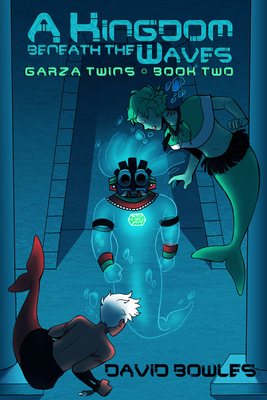 Now Carol and Johnny must join a group of merfolk and travel into the deepest chasms of the Pacific Ocean to stop him and his monstrous army with their savage magic. David Bowles is a product of a Mexican-American family and has lived most of his life in deep South Texas, where he teaches at the University of Texas Rio Grande Valley. Recipient of awards from the American Library Association, Texas Institute of Letters and Texas Associated Press, he has written several books, most significantly the ALA Pura Belpre Honor Book, The Smoking Mirror. Additionally, his work has been published in venues including Rattle, Strange Horizons, Apex Magazine, Metamorphoses, Translation Review, Concho River Review, Huizache, Journal of Children's Literature, Asymptote, Eye to the Telescope and Newfound.